Coat-X SA is very pleased to announce that we were one of the top 25 finalists on the Venture business plan competition. Coat-X SA is pleased to invite you to its presentation at the conference “Journées des Microtechniques Médicales”. Scheduled from 14:40 to 15:10 on the 15th of June 2016 at the EPHJ, Palexpo, Geneva, Salle U. This conference will be regarding: “Innovative thin‐film packaging for next generation flexible and smart medical device”. It is an honor and privilege to invite you to participate as a guest for this symposium. 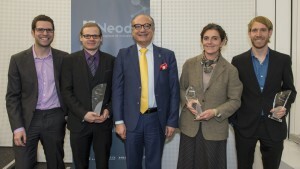 A collaborative project between Haute Ecole Arc and Johnson & Johnson (Le Locle), has been rewarded during the Neode Price 2015 Edition with a grant of 50,000 CHF. Coat-X may welcome a new era for medical implants. The Founder, Andreas HOGG, has received this prize during the second edition of said event dedicated to rewarding innovative and avant-garde companies. Andreas Hogg has been granted by Neode Price 2015 for his company project “Coat-X”. He created a new technology which allow to miniaturize medical implants and improve their leakproof propreties in order to resist to body fluids.